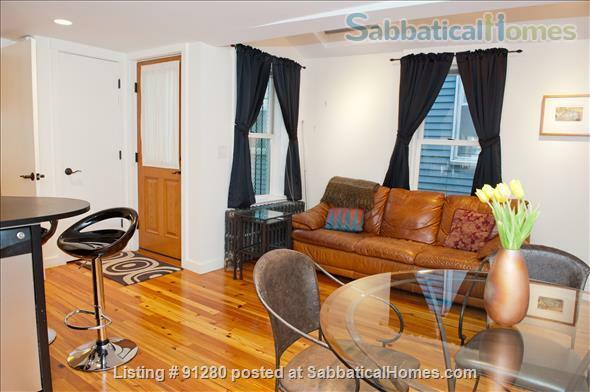 Newly renovated, modern, furnished studio apartment just outside Harvard Square in a well managed condo association building at 29 Concord Avenue. You can enjoy cooking in a fully stocked modern kitchen and / or dine out in one of the many fine restaurants in the area. The building was designed by famed architect, Hugh Stubbins, Jr. in 1965. This sun-filled, treetop studio is on the 5th floor with a private balcony and a magnificent view. Building amenities include an 8-story atrium, an elevator, private storage, and common laundry. A 10 minute walk to the Harvard Square red line MBTA, surrounded by Harvard University, and a very short distance to the Longy School of Music, and the Cambridge Common. The location is rated as "Very Walkable," a "Biker's Paradise," and "Excellent Transit" by walkscore.com. There is plenty of on street parking with a Cambridge resident sticker which means your car must be registered in Cambridge. This studio apartment has just been remodeled into a modern, sun-filled, apartment with constant comfort / whisper quiet Mitsubishi mini split air conditioning and all new furniture and kitchen appliances, including a Wolf induction cooktop, a Whirlpool built-in oven, a Liebherr refrigerator, a whisper silent Bosch dishwasher, and a microwave. The furniture includes an Eames designed coffee table, Hans Wegner designed chairs, a beautifully grained acacia wood dining table. a deliciously comfortable white leather sofa, and a custom built Murphy Bed with Sealy's premium top of the line queen sized mattress that disappears with ease into a custom made cherry wall cabinet. The bathroom is enveloped in beautiful floor to ceiling tile. The balcony window is graced with Hunter Douglas soft drapery like vertical blinds. It gets its electricity through a 100% Green Renewable Energy program. The studio remodeling effort was designed in collaboration with a local Harvard Square architect specializing in turning small, city dwellings into efficient, spacious and elegant living environments. An award-winning lighting designer designed the lighting and a local woodworker built the murphy bed and storage cabinets. And if you want to know what kind of landlords we are, check out our review here. For more photos and a video walkthrough, see links below. Security deposit required. Rent includes all utilities, wifi & twice monthly cleaning services. There is a flat screen TV with high speed wifi for streaming: 200 Mbps speed. Other: Includes sheets, towels, dishes, pots & pans, etc. My name is Carolyn and my husband, Bill, and I will greet you and give you the keys to the apartment or the studio (or our home if you are renting our guest room) when you arrive. Starting in 2010, we spent 3 years working with an architect, lighting designer, contractor and landscape designer to re-envision our home and to create an apartment on our first floor. Our home, our apartment and the garden have turned out to be delightful retreats in the middle of a bustling city environment. In April of 2015, we purchased the studio condo near Harvard Square. Over the next several months, we worked with the same architect, lighting designer and contractor to create a truly beautiful space near Harvard Square. One of the many joys of living in Central Square is that we walked to M.I.T. where we both worked in the IT department for many, many years. We retired in early 2018.